“Some economic security, no matter how small, is a giant step towards empowering communities." Women, who make up more than half of South Africa’s population, are disproportionately affected by poverty. Global Citizen partner Nedbank works with the Nelson Mandela Children’s Fund to help lift families and communities from poverty. Join us here. A group of women with spades, picks and trowels work patiently under the blistering sun, turning soil into concrete blocks with the block-making machine they bought through their R2 savings scheme. They call themselves the Masakhane Group, and they live in Eshowe, KwaZulu-Natal. Other than selling bricks, they also use their skills to build and renovate their homes, and as they stand back to examine the bricks that are changing their lives for R2 at a time, their faces beam with pride − they are at last self-empowered. The Masakhane Group - part of a savings mobilisation programme - got their start from the Nedbank Children’s Affinity programme, which was established in 2005 to support the Nelson Mandela Children’s Fund’s vision of a society where children live with dignity, are safe and nurtured. Through the programme more than R82 million has been invested in initiatives that help families and communities across South Africa with access to health, education and − through the Sustainable Livelihoods Project − empower women with the skills and means to participate in the economy. 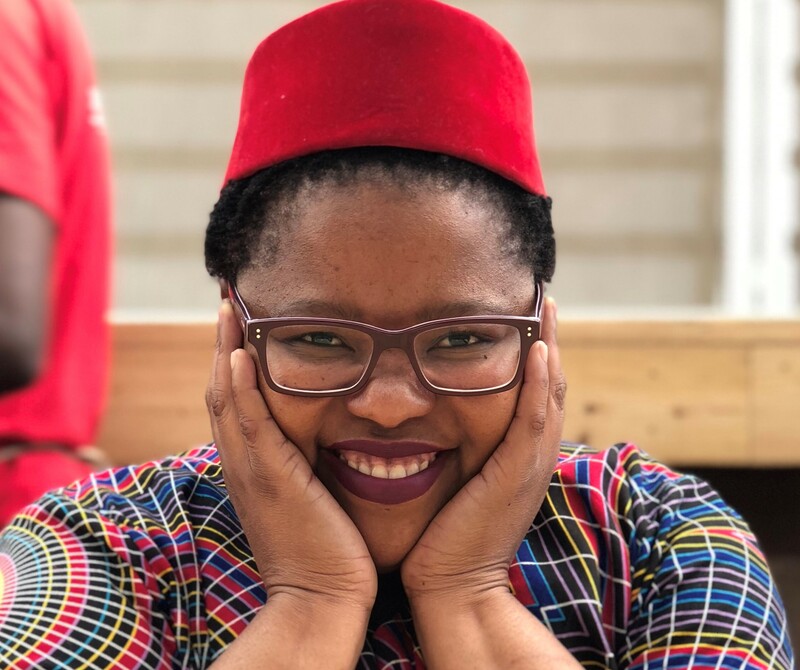 “The Masakhane Group is present across South Africa, consisting of 391 self-help groups of five to 20 people who have collectively saved R5,1 million,” explained the programme manager of the Sustainable Livelihoods programme, Mapule Cheela. “Each person contributes R2 a week to their savings group. They can also make a loan from the savings at 10% interest, and when the group has enough money, they can open a bank or post office account,” continued Cheela. The weekly contribution of R2 is small enough for everyone who takes part in the programme to afford and the number of the people in the group large enough for the money collected to make a significant difference. The Masakhane Group started in 2009 and, between then and 2017, they have managed to save R90 000. The Nelson Mandela Children’s Fund topped up the amount so that the group could purchase the block-making machine earlier this year as part of its sustainable livelihood goals. “It’s all about the ripple effect of a little bit of well-managed funding. We encourage people to form groups of no more than 20 to make sure the group remains manageable, and to commit to this savings investment model,” said Cheela. The savings and loans are used in various ways, including buying food, school uniforms, medicine and other daily expenses. Several groups have used their savings to develop small businesses, including purchasing ovens to bake bread and fence-making machines to keep small children safe, protect vegetable gardens or create camps for livestock. The Sustainable Livelihoods programme supports the groups by teaching them how to run and manage finances until they are doing well enough to manage on their own. The approach is based on the world-renowned microfinance model established in Bangladesh 40 years ago by Professor Muhammad Yunus of Grameen Bank. No collateral is required and the system is based on mutual trust, accountability, participation and creativity. “Some economic security, no matter how small, is a giant step towards dealing with vulnerability and getting out of poverty," said Cheela. The programme also teaches young people the importance of self-reliance, and encourages young girls to move away from the mindset of looking to boyfriends, husbands or being in transactional relationships for financial support. “They need to look after themselves and come up with ways to do this, such as a group of girls in Diepsloot, Gauteng, who are making branded mugs,” added Cheela. Some of the initiatives young people started through the programme include growing vegetables or starting small livestock businesses, selling food at schools and running after school programmes for primary school learners where they help them with their homework. Those who are interested in photography and videography are equipped to turn their smartphones into equipment. “We are currently working with a group of young people in Makhado, Limpopo, who have created a business plan to start a small sanitary towel factory to supply local stores. Their concept is to start small and, in time, scale up to bigger production runs, as well as branching into nappies. In addition to economic empowerment, an important part of the Sustainable Livelihood Programme’s work is encouraging families and communities to address social issues such as gender-based violence and child abuse. “It’s about empowering communities to unlock their potential and problem-solving abilities,” Cheela added. The programme will increasingly be focusing on organising young pregnant mothers in the rural areas into self-help savings groups and activities such as food gardens for nutrition and income generation. This way they will have a bit of money to look after themselves and their baby.